The Bellator MMA promotion has really picked up steam over the past year with some big time signings such as Benson Henderson, Chael Sonnen, Fedor Emelianenko and Rory MacDonald. These signings, along with some discontent among fighters for the UFC have really made Bellator a player in the MMA landscape and I expect them to slightly cut into the UFC market share in the coming years. I personally find myself watching Bellator events when there are a couple big names in the main event, which definitely was not the case in past years. It’s an exciting time to be an MMA fan now that Bellator is putting up some serious competition to the UFC. Each of our recommended betting sites do accept bets on Bellator events, with the big fights having their lines available sometimes months in advance. In this example, Chael Sonnen is the favorite over Tito Ortiz and the fight is expected to go over 2.5 rounds. Check out our MMA odds page for more information on how to understand these bets. These props are from a different bet than my Ortiz vs Sonnen example. In this prop betting example you can see that Eduardo Dantas is a very big favorite for the fight. 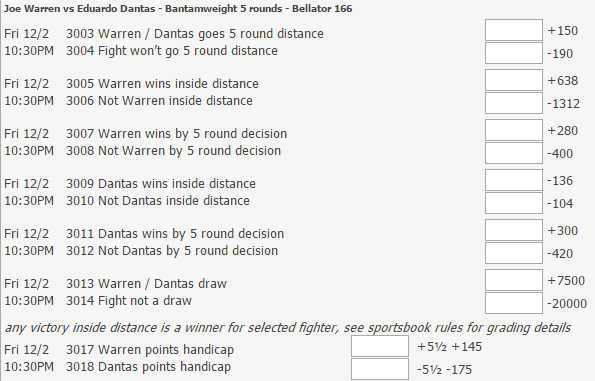 He has odds of -136 to win inside distnace, which means the bookies think there is a better than 50% chance that Dantas finishes Warren in this fight. Other prop bets you may sometimes see include method of victory and winning round bets. Check out our MMA prop bets page for more information on these. 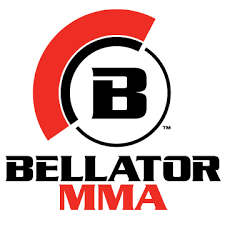 To learn more about Bellator MMA check out their official website.